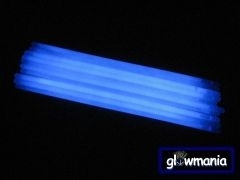 Glowmania was established back in 2004 and has acquired an unrivalled reputation for selling Top Quality Glow & LED Products coupled with its high level of Customer Care. We are centrally located in Cheshire and offer our products for sale at highly competitive prices. Lightsticks are like magic: a light you can carry around, with no apparent energy source. It's not magic that makes glowsticks work, though, but chemistry. Glowsticks are basically plastic tubes. Inside the tube is a glass vial (or more than one) containing chemicals. When you bend the glowstick, you break the fragile glass vial and release the chemicals. When the chemicals come in contact, they create a chemical reaction. The chemical reaction between these two substances produces enough energy to make light. It doesn't create enough energy to make heat or explosions, but it does make a nice longlasting light source. Since these two chemicals are common, harmless things, you can feel confident that glow bracelets, glow necklaces, and other lightsticks are safe for you and your kids. Coloured glowsticks also contain fluorescent dyes. The energy created by the chemical reaction gets the molecules of the dye moving, and that creates the color. As with many other chemical reactions, heat affects the performance of glowsticks. A colder environment will make a dimmer, longer lasting light, while heat will increase the brightness of your glowstick and make it last less long. If you want a dramatic effect and you don't need it to last very long, put your glowsticks in warm water or in the sun to supercharge them. If you want them to last for hours, but with a more subtle light, then put them in the freezer for a little while before you use them. Glowsticks are waterproof, do not use batteries, generate neglible heat, are inexpensive and are reasonably disposable. They can tolerate high pressures such as those underwater, which make them ideal for use by the Military Forces and Divers. Glow are considered the only light source that is safe for use immediately following a catastrophic emergency, because they do not use any kind of outside power source or create any danger of spark or heat. Often used in emergency situations they have been put to many other uses since their introduction in the 1970's. Now one of the most versatile, must have, accessories at parties, discos and festivals, adding immense colour and fun, they are a huge favourite with children and adults alike. Please see our comprehensive section on 'Uses of Glowsticks' for more ideas. Glowmania can provide you with exactly what you want at very reasonable prices to ensure great profits for you and so that everyone at the party can have their own. 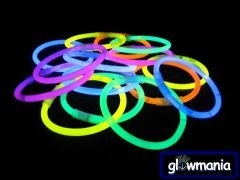 Most of our Glowstick products are unbranded making them ideal for resale. Click here to look at our extensive range of qulaity Glow and LED produts, or call or email us for any advice. 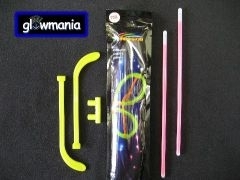 Glowmania offers only the best Premium Quality Glowsticks in different colours and sizes for all your party or celebration needs.